Jane Burden - Morris's future wife - was born in a small, three-roomed, insanitary cottage in St Helen's Passage off Holywell, Oxford. The Morris family moved to the Water House, in what is now Forest Road, Walthamstow, Essex. 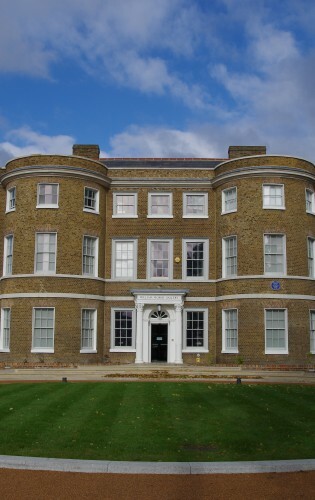 The Water House is now the home of the William Morris Gallery (http://wmgallery.org.uk). Morris wrote to his mother informing her he intended to become an architect. It is apparent from this letter that he had told her some weeks before that he had abandoned the idea of taking holy orders. The first number of the Oxford and Cambridge Magazine appeared under Morris's editorship. 750 copies were printed by Bell and Daldy of Fleet Street and sold for 1s. They were sent out in green printed wrappers with the contents printed in double columns. The magazine proved so successful that a further 250 copies were later printed. Morris contributed `The Story of the Unknown Church' and a poem called `Winter Weather'. 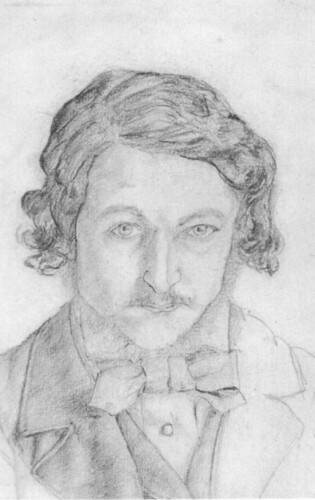 A self-portrait in pencil by Morris bears the date `29th July'.. The year of composition is conjectural. A second self-portrait also probably dates from around this time. Both portraits are now at the V & A. Encouraged by Rossetti, Morris left Street's office and abandoned his career in architecture. Mackail, in his Notebooks, recalled Burne-Jones saying that Morris `began painting directly on leaving Street'. Morris submitted his first volume of poetry - The Defence of Guenevere & Other Poems - to the publisher, Alexander Macmillan. Morris married Jane Burden at St Michael's Church, Ship Street, Oxford. The wedding was conducted by Morris's friend R W Dixon with Faulkner as the best man. The bride was given away by her father. According to the account that Burne-Jones gave Mackail `M. said to Dixon beforehand"Mind you don't call her Mary" but he did.' Dixon mistakenly married them as `William and Mary'. The entry in the Register reads: `William Morris, 25, Bachelor Gentleman, 13 George Street, son of William Morris decd. Gentleman. Jane Burden, minor, spinster, 65 Holywell Street, d. of Robert Burden, Groom.' The witnesses were Jane's parents and Faulkner. 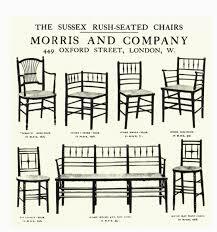 None of Morris's family attended the ceremony. Morris presented Jane with a plain gold ring bearing the London hallmark for 1858. She gave her husband a double-handled antique silver cup. Morris and Jane moved to the Red House, overlooking the Cray Valley near Bexley Heath, Kent. The house was situated three miles from Abbey Wood Station and only ten miles from the centre of London. The weather vane on the tower has the inscription `W.M. 1859'. 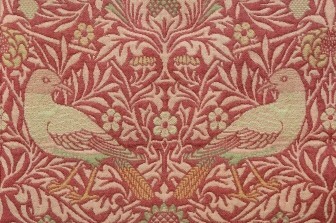 The house cost Morris about £4,000 to build and Philip Webb, Morris friend and prominent architect, designed the house. Jane Alice (`Jenny') Morris was born at the Red House. Morris named her Alice after his younger sister. She was - at a later date - christened at Bexley Church in Kent. A celebration dinner was held after the christening at the Red House which was attended by amongst others Rossetti, Swinburne, the Browns, the Marshalls and the Burne-Joneses. The centre-piece of the celebration was a lavish medieval banquet set out on a large T-shaped table. The men later spent the night on temporary beds set out in the drawing room. Morris, Marshall, Faulkner & Co. opened for business. The partners - Morris, Burne-Jones, Webb, Faulkner, Hughes (who withdrew soon after), Rossetti, Madox Brown and Marshall - each put up £1 as collateral. The main capital of £100 was loaned by Morris's mother, Emma. The Firm's prospectus was also issued. In its early days the members of the Firm held meetings once or twice a fortnight. The Trellis and Daisy wallpaper designs were registered. 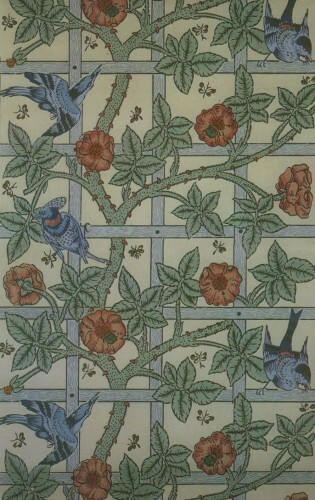 These were the first wallpapers produced by Morris. They were expensive to make as they each required twelve blocks (one for each colour used). Jeffery & Co, of Islington, were employed to print these wallpapers. The Kelmscott Press completed the Complete Works of Geoffrey Chaucer. It took four years to make - Morris met with Burne-Jones to discuss the designs for the Chaucer on 16 July 1892. By 8 August 1894 Sydney Cockerell recorded that the first page of the Chaucer was printed and then, on the 2 June 1896 the first two copies of the Kelmscott Chaucer were finally delivered from the binders after being complete on the 8 May. 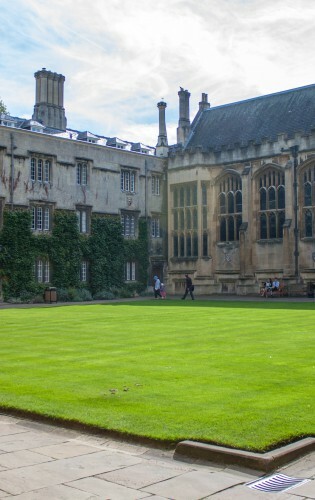 Morris's copy is now in the library at Exeter College, Oxford.